Pilate therefore went into the hall again, and called Jesus, and said to him: Art thou the king of the Jews? Jesus answered: Sayest thou this thing of thyself, or have others told it thee of me? 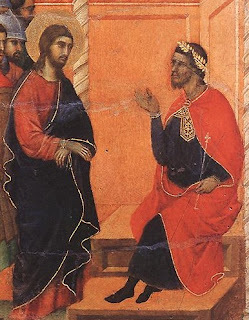 Pilate answered: Am I a Jew? Thy own nation, and the chief priests, have delivered thee up to me: what hast thou done? Jesus answered: My kingdom is not of this world. If my kingdom were of this world, my servants would certainly strive that I should not be delivered to the Jews: but now my kingdom is not from hence. 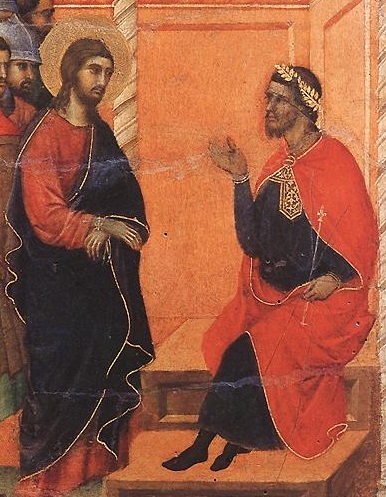 Pilate therefore said to him: Art thou a king then? Jesus answered: Thou sayest that I am a king. For this was I born, and for this came I into the world; that I should give testimony to the truth. Every one that is of the truth, heareth my voice. There will be no potluck/catechism next Sunday immediately after Mass, but there will be a potluck for the All Saints Day Party being held at the DeMasters' farm later that afternoon. See the newsletter and next week's bulletin for detail. Please remember the upcoming All Souls Novena of Masses and month of prayers. You should include the names of the departed whom you wish to be remembered with your donation and put it in the collection in the next couple weeks. The 2018 Fraternity Calendars have arrived. They can be purchased downstairs. The Procession in Honor of Christ the King will be next weekend. The forms to join the Confraternity of St. Peter are on the tables at the doors of the church. Please fill out the information and send them in. When you receive your certificate (probably in a few weeks) we will have the ceremony of reception. The annual count of Mass attendance will be taken the last two weeks of this month. These numbers will be used to determine the health of the parish.